South Africa skipper John Smit has hailed his side's achievement in claiming the Tri-Nations title, savouring a personal milestone with his first win on New Zealand soil in the process. Smit was out injured for last season's thrilling win in Dunedin but finally tasted victory after a gutsy 32-29 triumph at Waikato Stadium. "I've waited a long time for a win here in New Zealand; this is the first one that I've ever got," he told Sky Sports. "It's very satisfying for me as a person and this team has worked really hard. They've come from a World Cup win and kept that intensity up, I'm very proud of the boys." 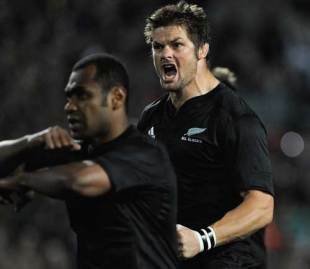 The Springboks raced in to a half-time lead, but were forced to cling on as first Sitiveni Sivivatu and then All Black skipper Richie McCaw crossed their line in the closing stages. "It was epic, we said at half-time that the All Blacks are always an 80-minute team and they didn't let us down," said Smit. "They came back at us, we wanted to come out strong and they showed the character that they've got. I'm happy my boys stuck it out and put on enough pressure to see it through at the end." Fullback Frans Steyn landed three penalties from inside his own half in the opening period and McCaw admitted that it was hard to watch the ball sail through the uprights from that distance. "It's hard to see those ones go over, you can't afford to have ill discipline," he said. ""In the first half we were slow to get in to the game. One positive is we did stick at it. "We wanted to put some pressure on them and which I think we did quite well. It did come right and it's testament to the guys hanging in there. In Test match rugby you've got to do it right from the start."